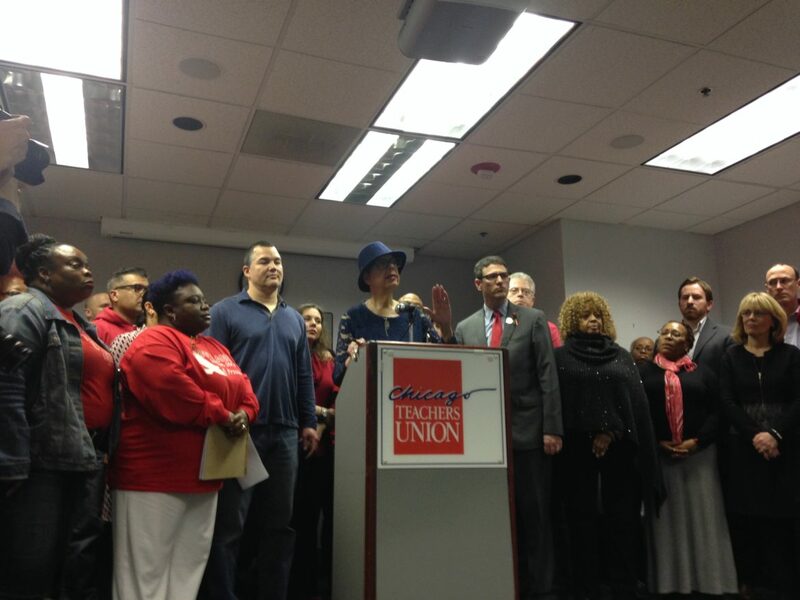 The Chicago Teachers Union's "big bargaining team" announced it has rejected the district's latest contract offer during a Monday press conference. After allowing the district’s last teacher contract offer to simmer for several days and then debating its merits, the “big bargaining team” of the Chicago Teachers Union rejected the proposal. Today’s decision boiled down to a lack of trust in the district’s promises, including those of no economic layoffs and a cap on charter school expansion through 2019, union leaders said. The Board wants to eliminate the so-called pension pickup, which would amount to a 7 percent pay cut, and is asking educators to pay more in health care costs. It has offered to raise salaries to make up the difference. Chicago Public Schools also promised no economic layoffs during the length of the contract, though union officials said the district is looking to buy out as many as 2,200 veteran teachers and paraprofessionals. The union’s rejection of the district’s offer means the clock begins to tick on the 105-day fact-finding stage of contract negotiations, one of the final steps that’s required under state labor law before educators can go on strike. But both sides expressed a willingness to return immediately to the bargaining table and avert a walkout. Lewis acknowledged that it is within her authority to present the district’s offer to the House of Delegates when the union’s 800-member governing body meets on Wednesday. But she said that action simply wouldn’t make sense when the 40 members of the union’s big bargaining team — made up of teachers, counselors and paraprofessionals — unanimously voted against the proposal today. Instead, she outlined a series of actions she says would build educators’ trust in the system. Lewis asked Mayor Rahm Emanuel to “declare a surplus” of tax-increment financing (TIF) dollars and redirect that money into the school system. CPS officials note that the district already receives millions in TIF surplus dollars, but that they are one-time revenues that won’t solve the district’s structural budget problems. The School Board has offered to restore a dedicated property tax levy for teachers’ pensions, but that would require legislation. It also has promised to seek “progressive revenue solutions,” but has not said what those would be. In addition, the district offered to keep the number of charter schools at their current number of about 130, though it would allow new schools to open if others closed. CPS would also cap student enrollment at charter schools, sources said. Many union members, who see charters as a direct threat to their own livelihood, doubted CPS could deliver on that promise. That’s because charters that don’t get CPS approval to open can bypass the district and ask for approval from a state charter commission instead. News of the district’s offer to cap charter school growth sent ripples of anxiety across the charter school community. Andrew Broy of the Illinois Network of Charter Schools said the very idea of a cap on charter schools written into a labor contract was unfair. Claypool has long said that up to 5,000 educators could lose their jobs if there were either no deal by the end of January or help from the state Legislature in the form of pension funding relief. However, at the moment, CPS officials are not suggesting there will be immediate layoffs. Still, Lewis acknowledged that rejecting the district’s latest offer could bring layoffs. “They may very well do that,” she said. She predicted that parents would protest that move, as it would mean increased class sizes. Last month the district issued pink slips to more than 200 non-union workers in Central Office and eliminated another 180 vacancies. CPS officials have said those cuts — in addition to others earlier in the school year — will save the district about $45 million annually. The lack of a tentative agreement with the CTU could have major financial implications for the district, which approved a 2015-16 operating budget that depended on a wish for a half-million dollars in state aid. Union leaders said they know that rejecting the district’s contract offer comes with financial risks.